I cooked up a batch of craft fair record bowls this weekend, so I thought I'd write up a tutorial, perhaps for the every single person who comes by my craft fair booth, looks at and lavishly praises my record bowls, holds them up to the light and admires them and talks about what they'd put in them, then says, "How did you make these?" When I give the very vaguest of replies as to how to make record bowls, these people invariably say, "Okay, thanks," put down the record bowl they're holding, and leave. Now I can say, "I have a tutorial on my blog," and hand them a moo business card with my etsy shop and blog addresses. Then, not only will people come to my etsy shop and my blog, but if they read the tutorial, they'll see how much work goes into making a record bowl, and they'll way rather buy one from me for five bucks than go to all the trouble of making one themselves. Score. 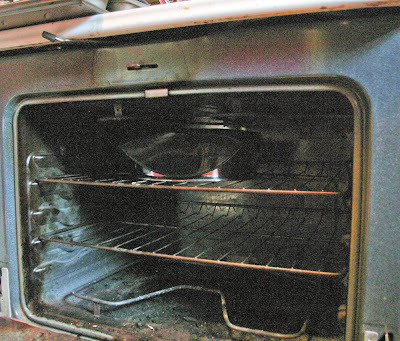 Take out at least one of the racks from your oven, put a metal bowl upside-down on the remaining rack, and preheat. Depending on your oven, you're looking for the magic temperature somewhere between 200 degrees and 250 degrees--you want the temperature hot enough to soften your vinyl record enough to make it really pliable and you want it to do this in a reasonable amount of time, say five or so minutes, but you want the temperature cool enough that it does not cause the vinyl to noticeably release toxic fumes into your house. 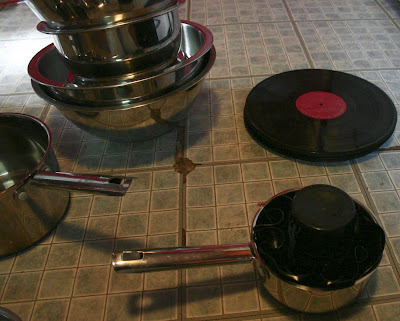 The vinyl will always release some fumes when you heat it, but if you can smell it, or you get a headache or burning nose, or your pet bird dies, your oven is too hot. I always use lots of ventilation when I do this, and I never work for more than half an hour at a time--less, if I let the kids help. And seriously, vinyl fumes will kill pet birds. 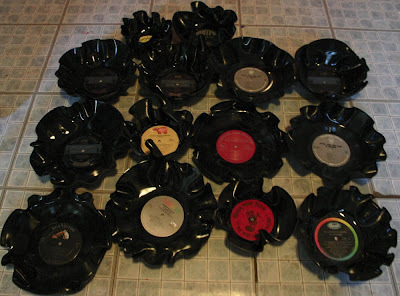 You'll need oven mitts to handle the record when it's hot, and a selection of pots, pans, mixing bowls, plates, and cups with which to mold your record bowls. I like to gather a large assortment and then experiment with different combinations for different shapes. 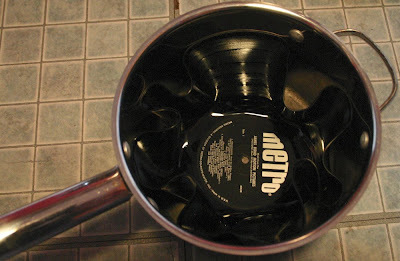 If you make a little mark with a Sharpie at the dead center of the pot you're using, you can find that mark in the hole in the middle of your record, and have a perfectly symmetrical bowl. 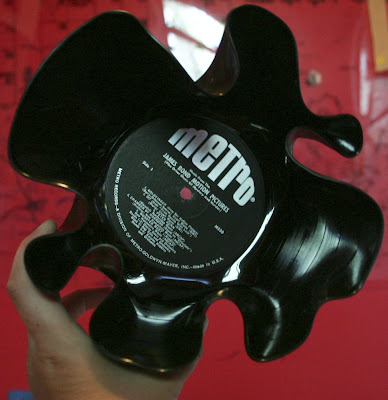 You can also experiment with forming the sides of your record by nesting another bowl, cup, or plate on top of the record in the pot. 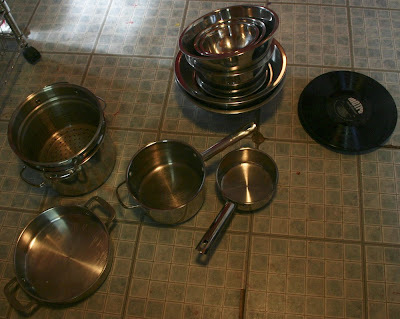 A nesting bowl slightly smaller than the one you're using, for instance, will form the sides really smooth and flat, and a plate placed on top of a record bowl that you're molding inside a large casserole dish will make a sort of record platter with a nice, flat bottom. 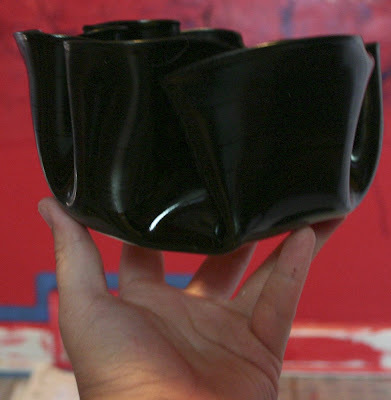 Here I used a cup for this somewhat narrow record bowl to keep the sides of the bowl from coming in too much: Remember that you've maybe only got a minute, tops, before the vinyl stiffens back up and you can no longer work with it, but you can always reheat it for another go. Here's the entire collection that I started making yesterday evening while Matt and the girls cleaned out the car in preparation for going to the drive-in and that I finished this morning before breakfast while they watched a little PBS: Man, I wish I owned a record player. Have you ever thought about using a solar oven? It may take longer but the fumes wouldn't be an issue outside. There are lots of websites explaining how to make them. We did and have had lots of success with cooking in it. Our oven seems to max out at about 225 degrees F, or so. I like the bowls by the way.